Mar is gnách ag deireadh téarma -Nollag, Cáisc agus Samhradh- beidh leath lá againn ar an Aoine 20.12.2013 -naí ranganna agus a deartháireacha & deirfiúracha ag imeacht ar 12.00. Ranganna 1-5 12.15. Beidh páistí an bhus ag imeacht ag 12.00. Tá fáilte roimh na páistí teacht chuig Bandon Co-Op maidin amárach, 30.11.2013, chun carúil na Nollag a chanadh ó 11.00 r.n. más maith leo. Níl aon bhrú teacht. Beidh sé neamhfhoirmiúil is ní gá do na páistí éadaí scoile a chaitheamh. Beidh na tuistí i bhfeighil a bpáistí féin. Má tá suim agat bí ann ag 10.50r.n. le do thoil. 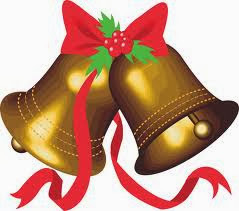 Our children are invited to sing some Christmas carols in Bandon Co-op tomorrow morning, 30.11.2013, from 11.00 a.m. to 11.15 a.m. There is no pressure whatsoever to come. It will be informal and children do not need to wear their school uniform. Parents will be responsible for their own children at the Co-op. If you are interested, please be at the Co-op at 10.50a.m. The Children's choir practice for Happy Birthday Baby Jesus will be in the parish church on Monday 16th December 2013 at 5.30p.m. for an hour. I know the time is not ideal but it is the best we can do. a bhuaigh an chéad babhta de Chomórtas Náisiúnta Díospóireachta na mBunscoileanna inniú (26/11/2013). Árdmholadh chomh maith do Rang a 5 ar fad as ucht an cabhair a thugadar le linn an ullmhúcháin agus as ucht a bheith chomh béasach agus dea-mhúinte le linn an díospóireachta féin. Bhí iompar Rang 4 ar fheabhas ar fad chomh maith. Is féidir linn go léir a bheith an-bródúil as ár bpáistí iontacha! Gaelscoil Chionn tSáile abú! who won the first round of the All-Ireland Primary Schools Debating Competition today (26/11/2013). Well done to the whole of 5th class for all the help that they gave in the preparations and also for being so mannerly and well behaved during the debate itself. Fourth class were very well behaved as well. We can all be very proud of our wonderful children! Up Gaelscoil Chionn tSáile! Dráma Na Nollag Rang a 1- Múinteoir Siobhán. Táim ag lorg suíocháin i gcomhair an dráma do rí bheag. Má tá ceann oiriúnach agat seol nóta chugam le do thoil, bheinn ana bhuíoch. I am looking for an armchair, fit for a small king! If you think you have something suitable (but not too valuable) I would be very grateful if you could lend it to us for our school play. Please let me know. Má tá siad uaibh tógaigí isteach an t-airgead le bhur dtola agus gheobhaidh sibh an annual díreach-mar ghnáth-shiopa! If you wish to purchase, please bring in the money and you will get the annual straight away-like a normal shop! Tomás agus Lúsaí-Áine gaolta le JFK!! 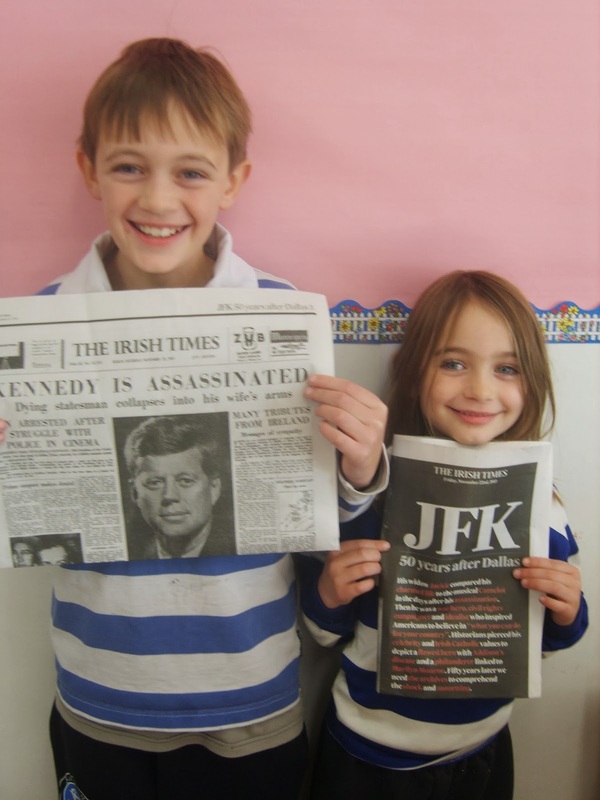 Tomás and Lúsaí-Áine are related to JFK!! Aifreann "Deanaigí é seo i gcuimhne ormsa" ar siúl an Sathairn seo 23.11.2013 ar a 6.30 p.m.
Caithfidh siad an leabhar "THUMB" agus DUILLEOG a thabhairt leo chuig an Aifreann. "Do this in Memory" mass is on this Saturday 23.11.2013 at 6.30 p.m. Please read pages 10-15 in the book, "THUMB", beforehand. Please make sure that they have coloured in page 43. They must bring the book, "THUMB", and a LEAF with them to mass. Fé mar is eol daoibh bhíomar ag feidhmiú mar gan beirt mhúinteoir ag tosach na bliana seo. Tá seo go huile is go hiomlán as ár láimhe. Níl comhacht ar bith againn ar seo toisc go mbíonn an scoil gafa leis an bpainéal gach bliain. Sin an cúis go raibh ár múinteoirí oideachais speisialta (Múinteoir Áine Ní Fhíobhra, múinteoir tacaíocht foghlaime i Rang 4 agus Múinteoir Alma múinteoir achmhainne i Rang 3) ag múineadh na ranganna seo go dtí an briseadh mean téarma. Fuaireamar múinteoirí sealadacha chun na ranganna seo a mhúineadh go dtí gur deineadh na hagallaimh ceapacháin. 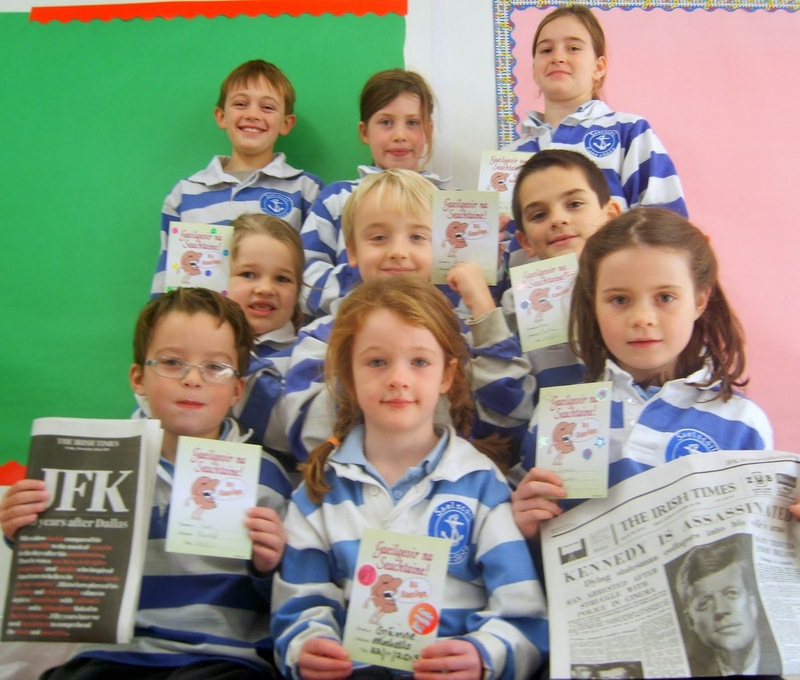 Bhí na hagallaimh san ar siúl sa scoil ar an gCéadaoin an 20ú Samhain 2013. Fuaireamar alán iarratais chun na postanna san a líonadh. An dea-scéal ata agam ná go bhfuil na múinteoirí roghnaithe anois a bheidh sa scoil don bhliain: Siobhán Ní Bhruacháin a fhanfaidh i Rang 4 agus múinteoir nua, Múinteoir Gráinne Ní Éalaí, a thógfaidh Rang 3 go deireadh na scoilbhliana (Meitheamh 2014). Tosnóidh an múinteoir álainn nua seo ar an Luan an 2a Nollag 2013. Is oth liom a rá mar sin go mbeidh Múinteoir Aodán ag fágaint slán linn. Gúimíd gach rath air sa todhchaí agus tá súil againn go bhfeicfimíd go luath arís é amach anseo. Tá súil agam go mbeidh deireadh seachtaine deas agaibh ar fad! As most of you are aware we were functioning without two teachers at the start of this year. This is a situation that was/is completely beyond our control as we cannot appoint our teachers until the panel of teachers for redeployment is cleared. That is why our Special Education staff (Múinteoir Áine -learning support- in Rang 4 and Múinteoir Alma -resource teacher- in Rang 3) were teaching classes until the mid term break. After mid-term we took on teachers in a temporary capacity until our vacancies were filled following the interview process. These interviews were conducted in the school last Wednesday 20th Nov 2013. The good news is that we have appointed our teachers! They are Siobhán Ní Bhruacháin who will stay in Rang 4 and a new teacher, Gráinne Ní Éalaí, who will take Rang 3 until the end of this schoolyear (June 2014). She will start here on Monday the 2nd of December 2013. I'm sorry to say that this means that Múinteoir Aodán will be leaving us. We wish him every success and hope to see him again and again in the future. Táimid ag obair ar dhrámaí na Nollag sa rang faoi láthair!! Tá a lán páistí sa rang ach ná bí buartha beidh páirt ag gach éinne. Beidh mé ag seoladh abhaile eolas faoi costumes srl ar an Aoine an 22ú Samhain '13. Beidh na drámaí ar siúl i halla Atha Mhaide ar an 17ú Nollag 2013 ag a 9 a.m.. An maidin an 17ú tabhair do pháiste go dtí an halla, gléasta ina éadaí don dhráma agus tiomáin thar nais ar scoil iad ina dhiaidh. Is féidir leat do pháiste a aistriú isteach ina éide scoile sa seomra ranga. Go raibh maith agaibh agus ná bíodh eagla oraibh teacht chugham má tá aon cheist agaibh i leith na ndrámaí. Táimid go léir ag súil go mór leis an lá! We are working on our Christmas play in class at present!! There are a lot of children in the class but don't worry, there will be a part for everyone. I will be sending home information about costumes etc. on Friday 22.11.2013. The plays will be held at Riverstick Hall on the 17th December 2013 at 9 a.m. On the morning of the 17th bring your children to the hall dressed in their costumes and drive them back to school afterwards. You can change them back into their uniform in the classroom. Thank you and don't hesitate to contact me if you have any questions about the play. We are all looking forward to the day! 17/02/2014 - 21/02/2014: School closed for mid-term. Tá foirm i mála scoile do linbh ón HSE inniu 18.11.2013. Líon isteach agus seol ar ais é chomh luath is féidir. There is a HSE form in your child's school bag today 18.11.2013. Please fill it in and return ASAP. Bhí cás eile míoltóga ghruaige i Rang Múinteoir Siobhán Ní Núnáin inné 14.11.2013. Ba cheart go scrúdófaí gruaig le bhur bpáistí le bhur dtola, páistí sa rang sin ach go háirithe. We have been informed of another case case of headlice-this time in Siobhán Ní Núnáin's classroom yesterday 15.11.2013. Everyone should check their child's hair, especially children in that particular classroom. The next Do This in Memory Mass will take place on Saturday, 23rd November 2013 at the 6.30pm Mass in St. John the Baptist Church. You might like to take the following suggestions into account to prepare for this Mass. As November is a time when we notice the cycle of death in nature, the children are invited to bring a fallen leaf with them to Mass to remind them to pray for a loved one who has passed away. Two parents will collect the leaves as you enter the church and they will present the leaves at the altar. You might like to encourage your child to colour the leaf on page 43 in the Thumb Book. You might like to read pages 10-15 of the Thumb Book with your child and you will find the Gospel for this Mass in the last Grapevine. The Priest will invite the children to stand at the altar for the Gospel and to sit in a semi-circle at the altar after the Gospel. Please arrive at least 10 minutes before the start of mass and take your place towards the front of the Church. We would like to remind you to please ensure that your child collects their copy of the Grapevine at the altar after Mass. 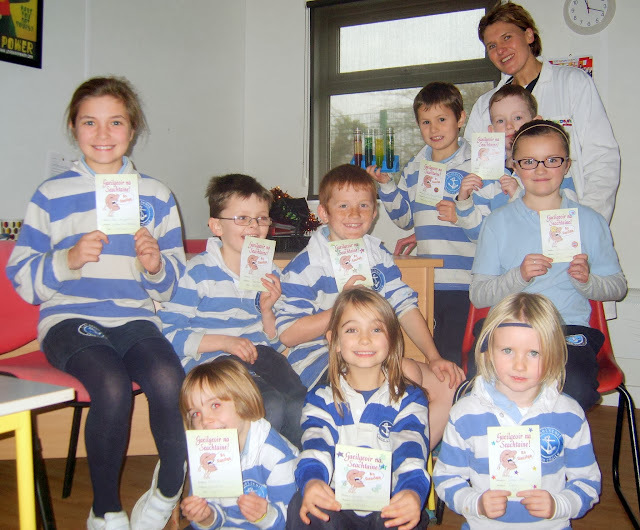 Fé mar is eol daoibh bhí Aonach Leabhair againn sa scoil a chríochnaigh ar an Mháirt. Dhíoladh thart ar €1,700 leabhair ag an Aonach agus uaidh sin bhí cead ag an scoil thart ar €1,000 a chaitheamh ar leabhair don leabharlann scoile. Táimid ag obair ar cúinne leitheoireachta a chruthú sa scoil mar sin cabhróidh seo go mór linn. Ba mhaith liom ár mórbhuíochas a gabháil libh go léir as uch bhur dtacaíochta. D'oibrigh Coiste na dTuismitheoirí go dian chun é seo a cur ar fáil sa scoil. Buíochas mór leis na tuismitheoirí a d'oibrigh ann gach lá chomh maith leis na páistí éagsúla a chabhraigh leo. Ar deireadh go raibh maith agat libhse na daoine a cheannaigh na leabhair éagsúla. Is iontach an rud é suim sa léitheoireacht a spreagadh sna páistí trí leabhair tairingeacha a cheannach dóibh ach tuigim nach bhfuil cúrsaí airgeadais chomh maith is a bhídís cheanna ag daoine. Táimid fíor-bhuíoch díobh. As you know we had the Book Fair at school which finished last Tuesday. 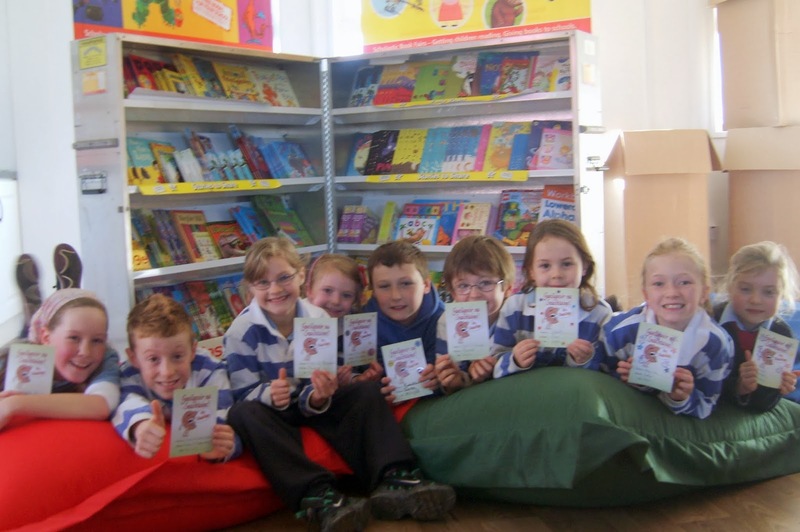 Over €1,700 books were sold at the fair and from that the school had permission to spend over €1,000 on books for the school library. We are working on creating a reading corner at school so this will help us a lot. We would like to thank you all very much for all your help. The Parent's Association worked very hard to run this at school. Also,a big thanks to the parents who worked there every day as well as the children who helped them. Finally, thanks to you, the people who bought the various books. It is wonderful to encourage the children's interest in reading in buying them attractive books but I understand that the financial situation is not as good as it was before for everyone. I am very grateful to you. Tá beirt tuismitheoir á lorg againn chun cailíní rang a trí a thabhairt go dtí blitz peile in Áth an Mhaide. Beidh an blitz ar siúl ar an Luan, 18ú Mí na Samhna. Beimid ag fágaint ag a 11.40 ar maidin agus beimid thar nais ag a dó a chlog (2p.m.). Téir i dteagmháil le Hilda chomh luath agus is féidir le bhur dtola. We are looking for two parents to take the girls from 3rd Class to a football blitz in Riverstick. The blitz will be on Monday, 18th November '13. We will be leaving at 11.40 in the morning and we will be back at 2 o' clock. Please contact Hilda as soon as you can. 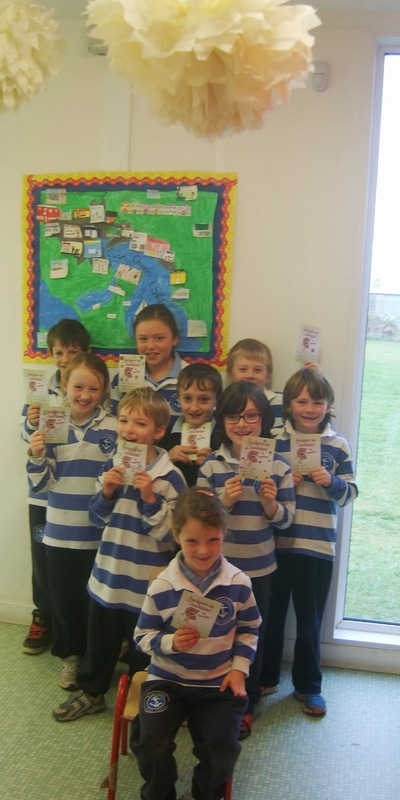 Táimid ag díriú isteach ar conas breith ar pheann luaidhí i gceart ar scoil faoi láthair. Déanann na páistí an módh 'pinch and swoosh' a úsaid chun a chinntiú go bhfuil siad ag breith ar na pinn i gceart. Tá físeán beag ar you tube a mhíníonn go héasca é. Déan google a dhéanamh ar 'pencil grip 'pinch and swoosh' agus bí ag cleachtadh sa bhaile. In school at the moment we are concentrating on how to grip a pencil properly. The children use the 'pinch and swoosh' method to make sure that they are holding the pencil properly. There is a little clip on You tube that explains it simply. Google 'pencil grip Pinch and swoosh' and practise at home. Tá ceistneóir i mála scoile do linbh anocht 13.11.2013. Líon agus seol ar ais é roimh an Luan 18.11.2013. Táim ar fáil má theastaíonn uaibh aon ghné don gceistneoir a phlé. Beidh mé ag glaoch oraibh pé scéal é má táim imníoch faoi aon rud. Beidh an scrúdú á thosnú againn i téarma a dó. There is a questionnaire in your child's school bag tonight 13.11.2013. Please complete and return it by Monday 18.11.2013. I am available if you wish to discuss any part of the questionnaire. I will be contacting you, anyway, if I am worried about anything. We will begin the assessment in the second term. Tá múinteoir Alma ag ullmhú an chóir do Feis Maitiú chomh maith. Tar chugham má thá aon cheist agaibh. Poetry Under 10 years old. If anyone is interested, bring in the money before Monday 25.11.2013 and your child will be registered. Múinteoir Alma is preparing the choir for Feis Maitiú also. Let me know if you have any questions. Tá éide scoile sa bhreis ag an scoil ón uair go raibh an éide scoile ar díol anseo. le tabhairt amach saor in aisce. Tar go seomra Múinteoir Michelle aon tráthnóna an tseachtain seo(ag tosnú 11.11.2013) ag a 1.30 chun iad a fheiscint. Dhá píosa éadaigh ar a mhéid an duine le tógaint. There are spare pieces of the school uniforms at the school from the time that they were on sale here. being given out free of charge. Come to Múinteoir Michelle's room any afternoon this week (week commencing 11.11.2013) at 1.30 to see them. 2 pieces of the uniform, max, allowed per person. Bhí cás eile míoltóga ghruaige i Rang 4. Ba cheart go scrúdófaí gruaig le bhur bpáistí le bhur dtola, páistí sa rang sin ach go háirithe. We have been informed of another case case of headlice-this time in 4th Class. Everyone should check their child's hair, especially children in that particular class. 1. A bheith in am gach maidin. Ba cheart go mbeadh na páistí ar scoil roimh 08.50 ar a dhéanaí. Bíonn cead acu teacht tar éis 08.30. 2. Gan pairceáil ag an bhfalla clocha riamh. Cuireann sé sin bac le teacht agus imeacht na ngluaisteáin uile eile. 3. Má tá do ghluaisteáin pairceáilte in aice na driseacha, brostaigh thar nais chuige agus saoraigh an spás do dhuine eile -bhí gluaisteáin fágtha ann go dtí i bhfad i ndiadh a 9 a chlog ar maidin. 4. Slán a fhágaint le do pháiste ag an geata -fiú sna Naí-ranganna. Déanann an neamh-spleáchas maitheas dóibh. 5. Gan bailiú timpeall ar an scoil ag na hamannta gnóthacha san. Bíonn Hilda ar fail chun cabhrú libh go dtí 1.30 gach lá mar sin dhéanfadh se níos mó chéile teacht thar nais níos déanaí nuair nach bhfuil brú ó thaobh pairceála de. Táimíd ag déanamh amach na huimhreacha don bhliain seo chugainn. Má tá páiste sa bhaile go bhfuil se ar intinn agat tosnú i Mean Fomhair 2014 bí cinnte go bhfuil siad cláraithe! Faigh foirm clárúcháin ar an suíomh agus seol isteach é don Luan le bhur dtola mar ta na litreacha curtha amach againn dos na tuistí nua. Nó má tá aithne agaibh ar daoine go bhfuil suim acu a bpáistí a sheoladh anseo abair leo iad a chlárú láithreach. I do acknowledge the parking issues outside but I am asking you all to be more conscientious in your use of the carpark/drop off area outside. I saw the issues first hand this morning when I was stuck in the buildup! This happened at 08.55 -a time that is too late for the children to be coming to school anyway. I am not normally in the carpark at that late time therefore it was interesting to see what is happening. I have some requests that I feel will help the situation. 1. Please ensure the children are in school in good time every morning. The children should be in school before 08.50 and 08.50 at the very latest. The children may come to school from 08.30. 2. There is no parking permitted at the stone wall ever. This interferes with the coming and going of all the other cars. 3. If you have parked by the ditch to walk your child to the gate, hurry back to the car and free up the space for the next parent who wishes to do the same - there were many cars parked there this morning well after 9 o clock. 4. Say your goodbyes at the gate -even to the Infant classes. They know their way to the classroom by now and it is good to give them some independence. 5. Please don't gather at the school in the morning. Hilda is available until 1.30 each day so it would make sense to come back at a less busy time when there's no pressure on parking. We are organising the numbers for next year's in-take of Junior Infants. If there are any siblings who intend to start Sept 2014 please ensure they are registered! If not, download a form from the site and send it in to Hilda on Monday. We have sent out our letters to next year's parents already so please don't delay. Likewise, if you know of friends or family intending to start Sept 2014, and who aren't registered, remind them to do it asap. Bíodh deireadh seachtaine deas agaibh! Have a great weekend! 'Sé Dé Luan (11.11.2013) an lá deireanach d'aonach na leabhar. 8.30 - 9.30, 1.30 - 3.00. Monday is the last day of the bookfair at school. 8.30am - 9.30am, 1.30pm - 3.00pm. Beidh na páistí i rang Máiréad ag déanamh obair ar m'amlíne féin an tseachtain seo chugainn (ag tosnú ar an Luan 11.11.2013). Beidh trí ghrianghraf ag teastáil ag na páistí chun an amlíne a dhéanamh. Cinn ó amanta difriúla mar shampla: báibín, 3 bliana d'aois agus ceann reatha. Children in Máiréad's class will be working on my timeline next week (week starting 11.11.'13). They will need 3 photos in order to create their own timeline. Preferably 3 from different stages in their lives. For example a baby picture, 3 years old and a current photo. Beimid ag tógaint grianghraf des na páistí le rud atá speisialta dóibh dos na filteáin SALF. An féidir le gach leanbh rud amháin speisialta a thabhairt isteach ar an Aoine 08.11.2013. Mar shampla, d'fhéadfadh siad bróg peile a thabhairt isteach mar go thaitníonn spórt go mór leo, nó teidí beag mar go bhfuil sé an chéad bréagáin a bhí acu. We will be taking a photograph of the children with an object that is special to them for the SALF folder. Can every child take in one special thing this Friday 08.11.2013. For example, they could take in a football boot if they love sport, or a small teddy if it was the first toy that they had. Mar is eol daoibh tá haca críochnaithe anois i gcomhair Rang a 2. Caithfidh na leanaí éide spóirt a chaitheamh anois gach Dé Céadaoin agus gach Dé hAoine i gcomhair corpoideachas. As you know, hockey is now finished for 2nd Class. The children must now wear their sports clothes every Wednesday and every Friday for P.E.